March is here and the growing season is now well under way outside. It also means the beginning of indoor seed growing for me, and the time of year when my seed trays jostle for space with trains, dinkies and transformers causing mayhem. I start nearly everything off in the house in our playroom/sunroom. It is a joy to watch and wait for the first signs of life from the endless array of pots and trays. I will never get tired of it. Although the growing of vegetables from seed is my priority I make sure to allow room always for a tray here and there of ‘fillers’ for the flower beds and borders. There are dozens to choose from in all the gardening centres now such as cosmos, salvias, nicotianas, cornflowers, nigella and wild flower mixes. One particular annual that I grow every year without fail is of course sweet pea or Lathyrus Odoratus. Seed catalogues usually contain pages of varieties to choose from and cultivation is very simple. A fertile planting spot and a climbing support are all that’s required. I usually make wigwams from bamboo and tie in the plants initially until their tendrils do the job. A slow-release fertilizer will help the blooms and regular cutting for small bunches around the house or to give as presents prevents the plant from setting seed. This year I am sowing Henry Thomas and Kiera Madeline which I picked up last year at the Chelsea Flower Show. I will also grow Miss Wilmott which is a very scented heirloom from Thompson and Morgan. I cannot ever pass DJ Murphy’s garden centre in Bandon without going in. My daughter’s hockey match in Bandon last Saturday provided the perfect excuse. 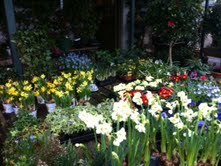 The wonderful display outside the front of their shop is always so enticing (see picture) regardless of the season. You can pick up lots of small colourful things for instant use in pots, window boxes and in beds. At the moment they have dozens and dozens of muscari, tete-a-tete daff’s, narcissus ‘abba’, anemones, violas, primroses and alpine plants. Their wonderful and rare collection of hens and guinea fowl are always fun to see and apart too from the super selection of plants, shrubs and tree’s they have possibly the best selection of pots, urns and stone ornmanents than anywhere else in Munster. I came home armed with a few little things, enough to give a hanging basket a new lease on life. I also bought Calicarpa ‘Profusion’ a rare and beautiful deciduous shrub which produces pink flowers in summer followed by tiny purple/pink berries in Autumn. These are a talking point in themselves. I had admired a lovely mature one recently in a magnificent garden in the south side of Cork and couldn’t believe my luck when I spotted a little one there in DJ’s. I left feeling so pleased with myself!